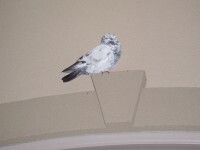 We have a pigeon who has been staying outside of our house for a few weeks. It has no fear of us and appears to be a domesticated bird (it hops around us when we are outside, it flies to the front door to greet us when we come home). Unfortunately, it has no leg band.